Google reader on the web through browser is always a good reader service but the main problem that people face is the navigation, which is limited just to up and down, and no direct jumping options to particular posts. But there is an Adobe air application that can help with better navigation. Earlier we shared the free RSS reader and organizer for mac named NewsFire, and it works perfectly and is similar to Readair, but Readair is an app which works with Google reader account and syncs with it. But NewsFire is an application that runs independently with no synchronization. Number of unread items for each feed are also displayed and total number displayed in the dock. You can directly jump to a blog post from title for a particular feed which is not there in Google reader in browsers. Check out more and download at Readair Google Code. I wonder what is faster after some time, Readair or NewsFire? @wbkinz: I think that Readair is faster. At least it starts up faster for me and it seems to work faster (although I’m not sure here – it’s just a feeling). 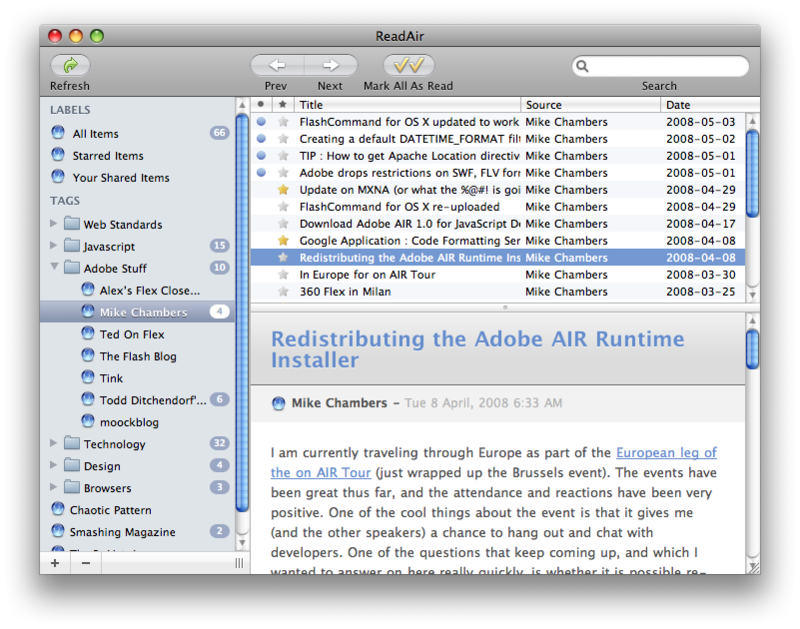 Readair is a cross-platform apps , but i like gmdesk better !! !